Home » Diet » Where does cholesterol come from? Cholesterol comes only from a source that can walk or swim and has a mother. In other words, animals. No vegetables, fruit or any other plant food contains cholesterol. Meat, fish, offal, eggs, milk and other dairy products all contain cholesterol because animals actually make cholesterol and this gets passed on into all foods derived from animals. As we are also animals, we also make cholesterol. In fact, most of the holesterol in our bodies is made by our livers. Only about 20 per cent of our total blood cholesterol comes from the food that we eat. Different meats and other foods derived from animals contain different levels of cholesterol. Among the highest cholesterol-containing foods are red meat, offal and the yolk of eggs. To reduce the amount of cholesterol that we consume, we should therefore cut down on these foods as far as possible. But only about 20 per cent of our blood cholesterol comes directly from the food we eat. The rest is made by our own bodies. One way to reduce our bodies' production of cholesterol is to cut down on our intake of fats. The amount of fat that we eat contributes much more to our blood cholesterol than the amount of actual cholesterol we consume. 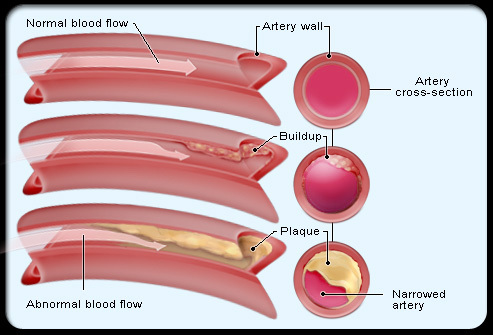 Saturated fats are particularly harmful as they tend to increase the level of the bad cholesterol, LDL, in blood. Nutritions recommend that we get only 30 per cent of our total calorie intake from fats. But only 10 per cent of this should come from saturated fats. The other 20 per cent should be from either polyunsaturated or monounsaturated fats.